You’ll want to skip your next trip to your local taco truck. 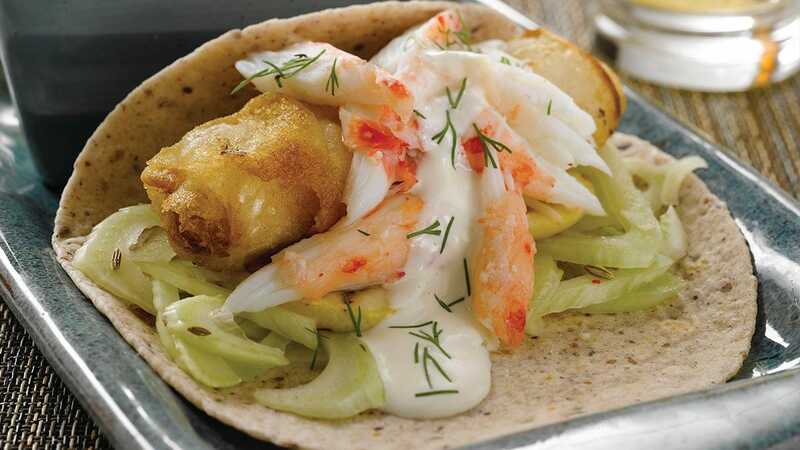 This yummy fish taco recipe comes fully loaded with crispy, rice paper-wrapped halibut bundles, tender crab meat and a bright, citrusy lemon mayo. 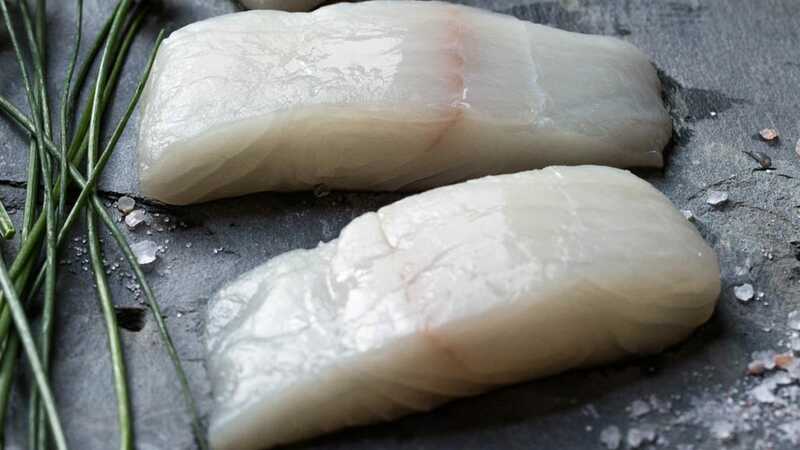 Slice Alaska Halibut into 4 long thin strips. Season with salt and pepper; drizzle with olive oil and Meyer lemon juice. Set aside, letting fish come to room temperature. Use kitchen shears to cut the Alaska King crab shell open and remove crabmeat. Chop or shred meat, if desired. Keep crabmeat cool until ready to assemble the tacos. Shave fennel bulb into very thin slices. Toss with a very small amount of olive oil (to moisten) and lemon juice. Add toasted fennel seeds; season with salt. Sauté leek in olive oil until tender; season with salt and pepper, to taste. Make 8 thin lemon wheels; remove seeds. Grill lemon wheels until lightly charred on both sides. Make a sauce by mixing mayonnaise with garlic, 2 tsp. lemon juice, and the zest from one lemon; set aside. Soak a rice paper (spring roll wrapper) in warm water for about 10 to 15 seconds, until soft. Place rice paper on a clean, damp dish towel. Shake any excess moisture from one halibut strip and place it on the rice paper. Spread fish with 1/2 tsp. Dijon mustard and top with sautéed leeks. Fold the short ends of the rice paper over the fish, then roll into a bundle. Repeat to make 4 fish bundles. Fry fish bundles in canola oil over medium-high heat until golden brown, about 3 to 4 minutes per side. Remove to a paper towel, season with salt while hot. To assemble tacos: Heat tortillas on a grill or comal until hot, about 60 seconds. Place shaved fennel and two lemon wheels on each tortilla, top with a fish bundle and crabmeat. Dollop with lemon-mayonnaise sauce and finish with a sprinkle of fresh dill. Serve the extra sauce on the side. Experts all agree—the perfect temperature for deep-frying fish is 375 degrees. We recommend using a deep-fry thermometer to make sure your oil reaches the right temperature.